We have seen it time and time again. A team has an A+ starting goaltender and does well in the regular season only to fall short in the playoffs -- this article is not solely directed at the Pittsburgh Penguins since 2009. Maybe the goalie starts to struggle in the playoffs, but the team is reluctant to turn to its backup goaltender. That backup was OK for the regular season, but now everything is on the line. I have always thought that a Stanley Cup caliber team needed a competent backup. Someone who can apply pressure to the starter, but not threaten him. Also, someone that can step in should an injury arise to the starter. I decided to take a look at the starting goalie and backup goalie tandems on the Stanley Cup winning teams since the lockout in 2005. Before I continue with the goalie data, it is clear the Penguins have seen both sides of the coin. 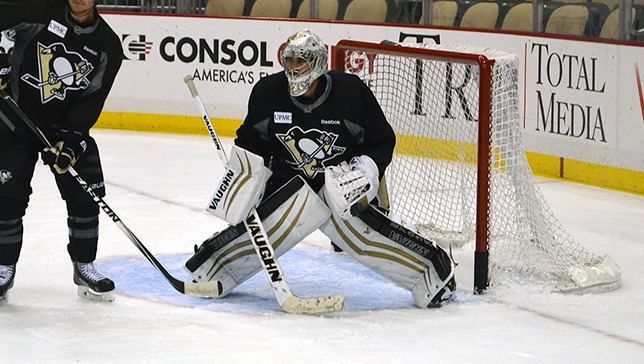 For the most part, the Penguins have had competent backup goalies for Fleury -- Ty Conklin, Dany Sabourin, Mathieu Garon, Brent Johnson, Tomas Vokoun, Jeff Zatkoff. It is clear that each of those goaltenders are OK for the regular season, but can you really trust them to win you a game if need be? When Marc-Andre Fleury struggled in the 2013 playoffs, Tomas Vokoun, a former starting goaltender, stepped in to right the ship. If Fleury struggled last postseason, however, would anyone have felt comfortable if Jeff Zatkoff assumed the starting role? The Penguins realized this and signed a very capable backup in Thomas Greiss in the offseason. I believe his role is more important than people realize to the Penguins this season. The data above is strictly regular season. For the most part, if you are a Stanley Cup winning team, your starting goaltender starts every game for you in the postseason. There are, of course, the three exemptions I noted where Niemi, Osgood, and Ward won the starting position and were ultimately the starting goaltenders for their teams' cup runs. When I began looking at the above chart for the past nine seasons, many things jumped out at me. First, and this should probably go without saying, teams need a competent backup or backups. Only one situation, the 2012 Los Angeles Kings, did the backup play less than 20 games in the regular season. Often times, the theory behind that is teams do not want their starting goaltender overtaxed for the postseason. There were only three situations when the backup goalie(s) had a losing record in the regular season -- 2012 Kings, 2011 Bruins, and 2009 Penguins. There were also only two situations when the backup goalie(s) save percentage was below .900 -- 2009 Penguins and 2006 Hurricanes. Additionally, Cam Ward had a pretty horrendous 3.68 GAA in 2006 as well. That was certainly an anomaly to the rest of the data. He was also the only one on the list who was a rookie, and oddly enough, was still able to step in that postseason to lead the team to their first Stanley Cup. It is pretty clear from the above list that maybe the best link among Stanley Cup winning teams is that their backup goaltenders have clear starter potential in the future. This is what makes the Sabourin/Garon tandem even more surprising. No one can be sure how this season will play out. The Penguins are one of the hottest teams in the NHL with a 12-3-1 start, but stop me if you have heard that before. The one thing that rings true is that the Penguins will need Thomas Greiss to step in fairly regularly this season to spell Marc-Andre Fleury. I would guess he will end up with 20-25 games by season's end, and he is off to a great start for the team. If the Penguins are going to contend for the cup this season, I guess the biggest question is... do you think he is an eventual starter in this league?